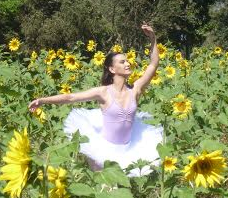 Read about my 2013 interview with Cecilia from Brazil, who became first an adult ballet dancer and over the years she became teaching ballet to other adult beginners herself. She has qualified and passed RAD Intermediate ballet examsa s an adult (which is the minimum to apply for their teaching courses) and continues to pursue higher RAD ballet exams. Read her inspirational story and interview below. I live in Brazil, I’m 39 years old, married with no children. I’m a graduate in Physical Education, I’m a fitness instructor, Pilates instructor and my currently main job is teaching ballet for children and adults in a dance studio and also in a Country club. I had my first memories of dancing in a ballet baby class my mother put me in when I was 3 years old, I guess. I remember her reading to me from a small paper where the teacher wrote the things she would provide me to dance as: Leotard, dance shoes, tights, hair net… those words were so curious to my child’s mind! I guess I only had few months of classes. After this, I had some Jazz classes when I was 12 years old. I used to live in a small city and there were no ballet classes available. I started taking serious ballet classes when I was 16 on the Juliana Yanakiewas Studio in Niteroi, RJ. Vaganova’s Style. The studio was old and decadent. My first year in ballet was almost of private lessons, because there were no beginner girls of my age. My teacher’s name was Lenita Rocha. After my first year, I started to work as a cleaner on the studio to pay for my classes, because my parents were already paying all my bills to keep me in college. During that time, the studio owner Juliana Yanakiewa allowed me to do all the classes I could, and I had the chance to do Tap, Jazz dance, Spanish passodoble, Modern dance. So I studied from 16 to 21 years old and stopped, because college and dancing was hard and exhausting, and I had no motivation to continue because almost nobody used to watch my rare performances. What made you decide to start/come back to ballet? And how did it happen? After 9 years of absence, I was working on a big fitness center as Instructor on the Weight training when I met the ballet teacher and she became my friend. SO, she told me I could take her classes in the studio she used to work. So I came back to ballet. The teacher used RAD style and it was a free class. My first year after returning was very hard and I used tostruggle with allegros and changing directions. Even nowadays, I struggle with quick steps. How long have you been dancing now? After my returning it has been 9 years now. Three times in a week: one Intermediate-advanced free class, and 2 Advanced Foundation RAD syllabus. What are your current challenges in learning ballet as an adult? What are your most common Corrections? My challenge is to put my hips over my toes, I have problems with putting my weight in the right place. My common corrections are about posture and weight placement, and also about musicality. About my body, I struggle with stiff hips and lack of turn out. How did you get started on the RAD syllabus? After 5 years doing free classes, I had an opportunity to be a trainee in ballet classes as Assistant, and then I had my chance to teach. So, I started to learn the syllabus as a teacher, first studying the lower grades and doing RAD courses for teachers, and then, 3 years ago I placed my first examination for Intermediate Foundation (old Syllabus), and I was approved. Was it hard to find a cLass/teacher who would accept adults in your RAD class? Do you take class with children/teenagers? How do you feel about that? It was not hard to find, as I’m a friend of many studio owners, and one of them offered me to take classes in her studio. I already took classes with teenagers, and I really don’t care about the age difference. Actually they respect me and have me as friend, and they are very supportive. Are there adults in your class? My classmates on this grade are between 17 and 22 years old. Any adult ballet dancer friends who are also learning the RAD SYLLABUS and taking exams with you? Yes. I also have virtual ballet friends because of my youtube channel. I had private lessons last year because of my Intermediate Examination (New Syllabus). I loved it! I love to have a teacher to scan my body and give me corrections. I don’t get tense at all! I enjoy it because I really like to repeat the combination, in order to improve. What else do you do to help improve your ballet technique? dancing, and this is what took me to my youtube channel. I already had a lot of good input there, some teachers gave me good tips and corrections, and I found this a nice way to connect with others adult dancers in the world living the same situation. I teach 2 adult ballet beginner classes right now, and my big challenge is to help them to develop their self esteem, self confidence. I would tell them: Don’t be afraid to expose yourself. Don’t be afraid to make mistakes and to go wrong. Accept your teacher’s corrections as an act of love and caring, receive the corrections and work on yourself, and you will find pleasure in dancing. Dancing is not only about learning the correct steps, but about expressing your feelings, emotions through your body. Find your place dancing, and dance for yourself. Don’t expect anyone’s approval. Ballet Dancer who became a ballet teacher’!